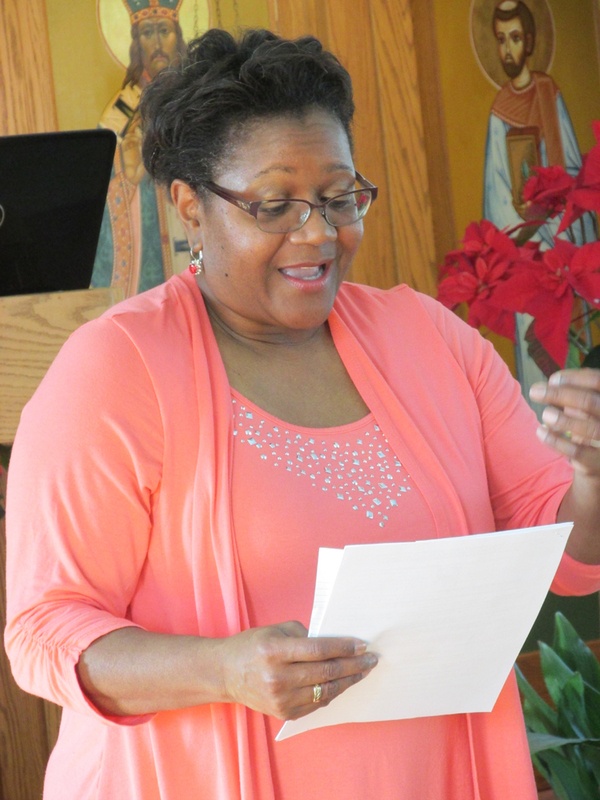 Sharon Gomulko, (middle photo) the President of the local chapter, organized this outreach mini-seminar, which was attended by about 25 people of diverse backgrounds; Fr. 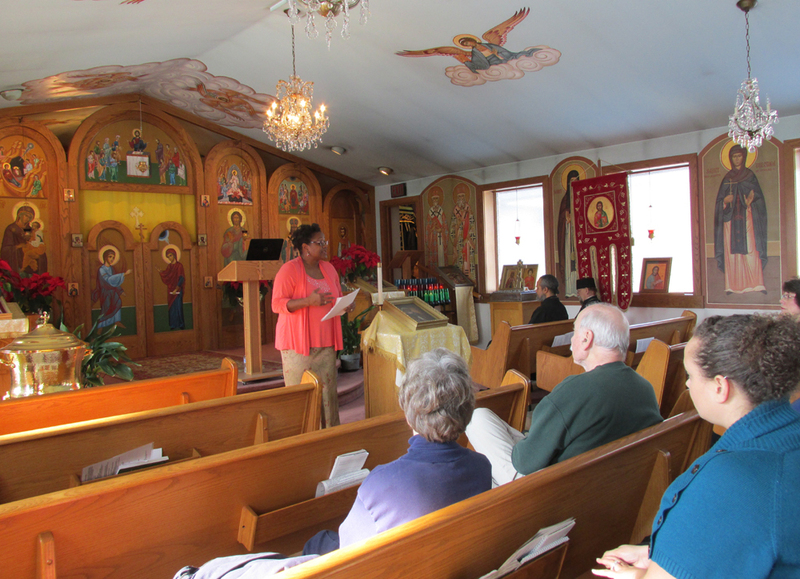 Jerome’s inspiring and dynamic talk was followed by refreshments, a church-tour and Vespers. Fr. 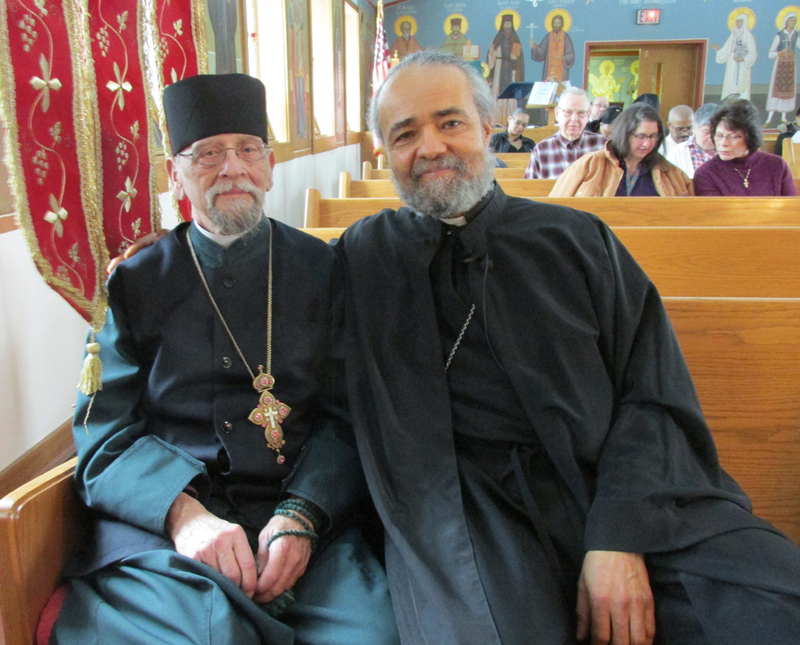 Jerome (photo on the right) is an African-American Orthodox priest in the Patriarchal Bulgarian jurisdiction, who lives in Indiana, and is one of the co-founders of the national Brotherhood of St. Moses the Black over 20 years ago. Fr. Jerome’s presentation was about the life of St. Moses the Black, and its relevance for us today. St. Moses lived in the fourth-century in Egypt, at the time of many noted Egyptian desert fathers. St. Moses originally had been a violent, hate and anger-filled murderer, thief and gang-leader, who was converted to Christ and became a desert monk, and gradually was transformed into a model Christian, filled with repentance and humility, love and wisdom. St. Moses is seen as a model for us today — if someone like the violent gang-leader Moses could be so transformed by Christ’s mercy and grace, then anyone can similarly be forgiven and lead a redeemed life of repentance and humility. The main purpose of the BSMB to bring knowledge of the life-saving message of Christ, as maintained by the 2,000-year-old Orthodox Christian Faith, to all Americans, especially to those of African descent, so that they might become transformed into Christ-centered people. The Metro-Detroit Chapter of the BSMB was the first local chapter of the national Brotherhood to be formed. Fr. 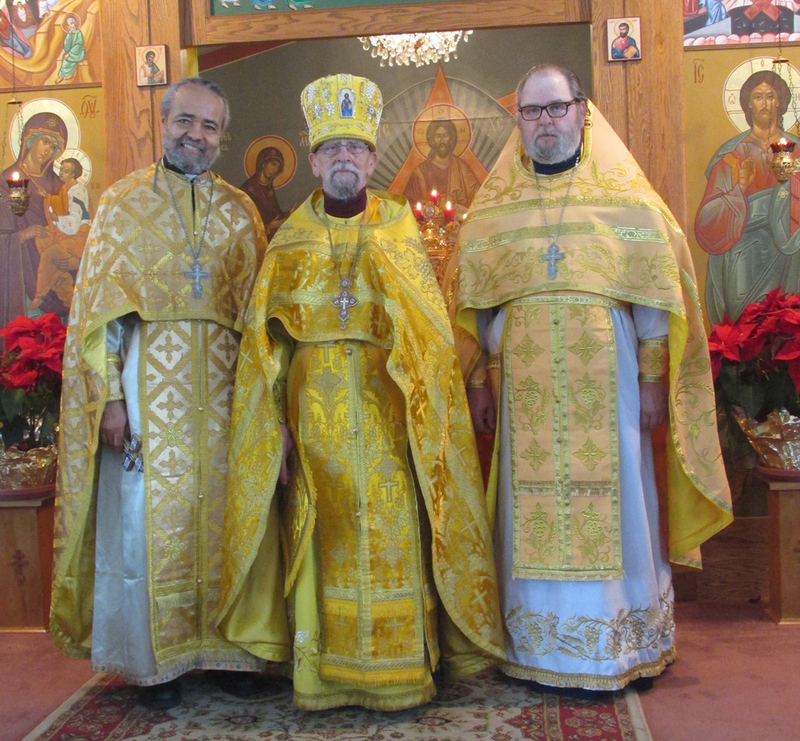 Roman Star, the host of this mini-seminar, was the initiator and founder of the Detroit Chapter, established in January of 2007, and which grew out of the Council of Orthodox Christian Churches’ Evangelism Committee that Fr. Roman had created a year earlier. 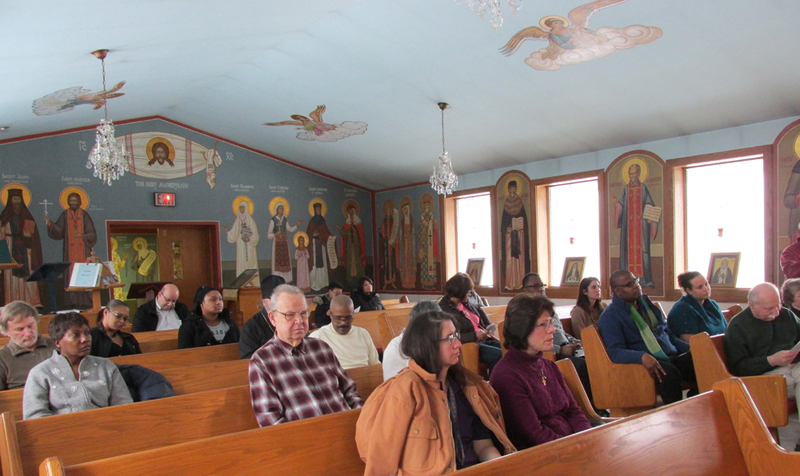 From its inception, the Detroit Chapter has been based at St. Innocent Church, and Fr. Roman has been its Spiritual Advisor. Fr. Roman also is a member of the Board of Directors of the national Brotherhood, and is on its Governance Committee. Both the national Brotherhood and the Detroit Chapter are in the process of revitalizing its mission and activities. On Sunday, February 1st, Fr. 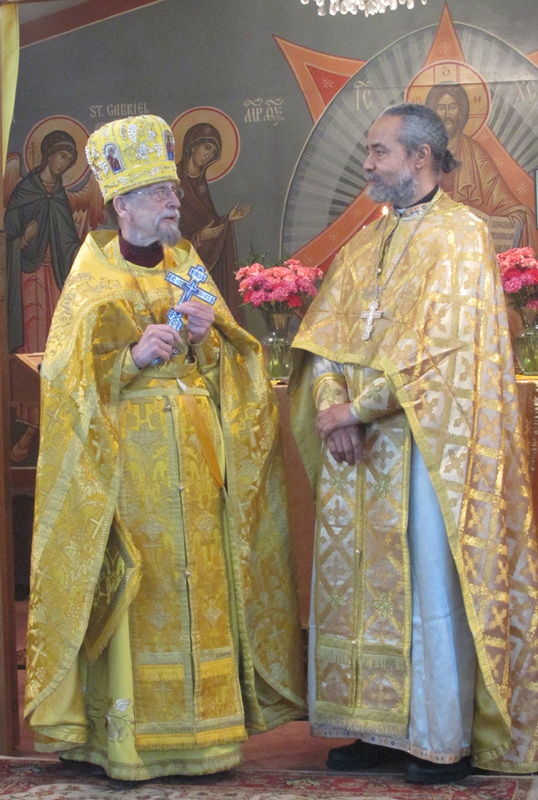 Jerome also concelebrated Divine Liturgy with Fr. Roman and Fr. Daneil Shirak, and gave the sermon. St. Innocent Parish was blessed to have Fr. 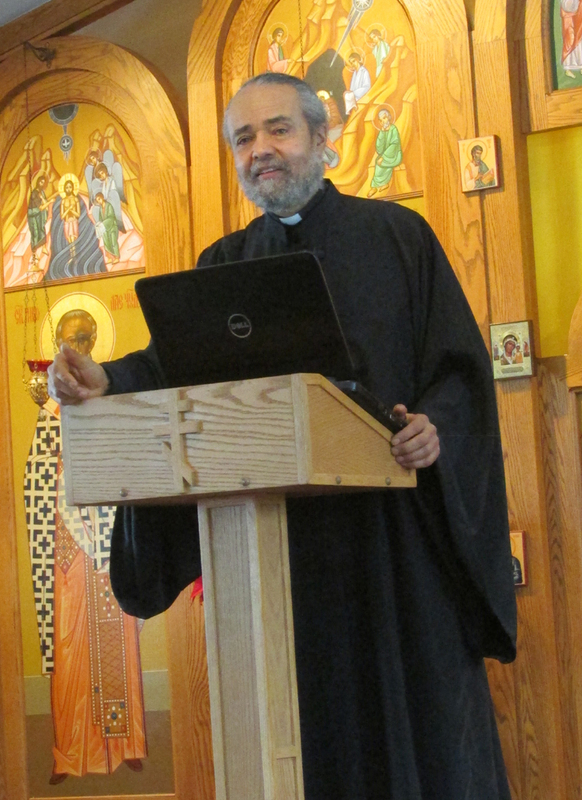 Jerome with them, and certainly, all those present at both the mini-seminar and Liturgy were inspired by his words.